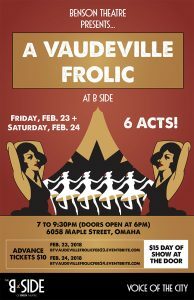 Benson Theatre is pleased to present A Vaudeville Frolic at B Side – the second in its series of monthly vaudeville showcases – Friday and Saturday, Feb. 23-24, at 7:00pm at The B Side of Benson Theatre, 6058 Maple Street. Tickets are $10 in advance or $15 day of show at the door. 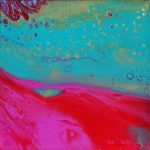 All proceeds benefit the theater’s capital campaign. 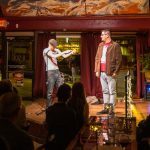 Aly Peeler will emcee the February showcase, which will include performances by Travis Newcombe (magic), The Omaha Jitterbugs (swing dancing), Erin Feichtinger (comedy), Justin Holman (poetry & American Sign Language interpretation) and more. Friday night will also include a brief presentation from Aaryon Bird Williams about the important efforts of local organization Fliye Arts. Both evenings will include a brief presentation from Benson Theatre Executive Director Amy Ryan on the restoration of 6054 Maple St.
Support for Benson Theatre’s monthly vaudeville showcases is made possible in part by the Douglas County Visitors Improvement Fund. For more information about Benson Theatre, visitÂ www.bensontheatre.org.